For many people their wedding is one of the most important days in their lives. You will want your wedding to be one of a kind and an event to remember, although planning a destination wedding requires a lot of work and proficiency, as there are many things to take into consideration. Planning your beach wedding is a difficult task and although a beach wedding can be cheaper, when planning a cheap beach wedding you will have to keep your budget in mind and stick to it. Once you have figured out how much money you have to work with, there are certain aspects that will influence on your budget, even if you have your wedding coordinator, as you need to consider using limited resources in the best way possible. In the hurry of booking, packing and flying, couples often forget the mainstays of travel savings, a significant aspect to take into account when planning a cheap beach wedding. With extensive knowledge to take care of all the details, our enthusiastic and experienced staff can give you the best advice in planning a cheap beach wedding; just contact our planner at All-Inclusive Weddings.com. There are things you need to know before planning a cheap beach wedding. You need to create a realistic and stress-free financial plan for your beach wedding and get competitive, affordable travel and accommodation packages for you and your guests. Beach weddings have become a major choice for people who want something really special and far from a traditional wedding. Besides, a beach wedding in a well-appointed all-inclusive resort could be a fun and relaxing getaway for you and your guests, but you should plan it together to guarantee the result exceeds their expectations. Properly planned, a beach wedding can not only save you a lot of money, but it can also turn your wedding day into an unforgettable vacation for you and your guests. If you are planning a cheap beach wedding, you need to know that some places are not possible for foreigners to get married and some are more difficult than others. For example, France requires you to be resident for 42 days, which implies a considerable expense. On the contrary, most of the Caribbean countries require less than a week, fact that makes these countries cost effective destinations. When planning a cheap beach wedding, you need to take into account that the month you want to marry will considerably influence the cost of your wedding. Every destination has a high season and a low season when prices reflect demand. In the Caribbean, for example, high season runs from mid-December through mid-April. So, beach weddings during the high season fluctuate in price across the Caribbean from a few hundreds to many thousands of dollars depending which island, time of the year, resort and package you take. The same thing happens if you decide to avoid the weekend; you can usually get a much better deal depending on the All-Inclusive Resort, wedding site, and even on travel costs during weekdays. That dream location that has a very expensive site fee on a Saturday may not claim it on a Tuesday, as during the weekdays the demand is lower. In the case of your destination site, you may also find a less expensive perfect destination and the perfect ceremony in a small city than in a larger one. Another important aspect you need to consider when planning a cheap beach wedding is to decide your wedding date and book it with sufficient time, as wedding dates start to disappear a year in advance. Make sure the wedding date is available at the all-inclusive resort or hotel you would like to stay and, of course, make sure that the judge is available too. Beach weddings are for direct family and close friends. So, as soon as you start planning your cheap beach wedding, create a list of must-invite guests, figure out how much you will pay per person and who is essential to the event and then check if they will be able to make it. When planning your cheap beach wedding, you need to take into consideration that although it is sometimes possible to negotiate with the hotel and airlines separately, there are many weddings packages that are incredibly convenient and economic. This is a cost-effective way to protect your budget. The wedding package will cost you the price of a vacation, while the guests generally pay for their own trips. 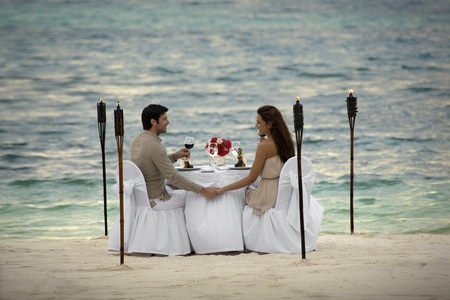 You can plan your beach wedding by yourself or choose a wedding planner to do it for you. 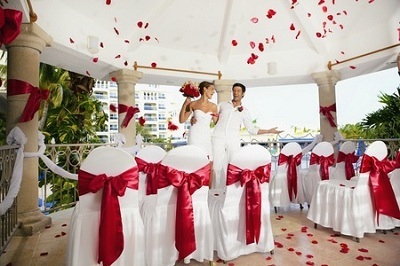 However, All-Inclusive-Weddings.com offers wedding packages with excellent options available. Wedding packages include wedding coordinators as well as all the niceties required for the wedding. Our experienced staff at All-Inclusive-Weddings.com is prepared to handle every aspect of this major occasion in a more practical and cost-effective way and will help you to set everything according to your desire. Consult our planner for more information. Why choosing All-Inclusive-Weddings.com as your wedding planner? If you decide to book your rooms with All-Inclusive-Weddings.com we will take care of your destination wedding planning for you at NO ADDITIONAL COST. We will walk you through the paperwork; help plan the reception and activities before and after the wedding and serve as your liaison to the coordinator at the hotel. We will do everything we can to guarantee you a perfect beach wedding.